Work Related Learning enriches and adds another dimension to the pupil’s education in Key Stage 4. It gives them ‘hands on’ and practical experience of the world of work. 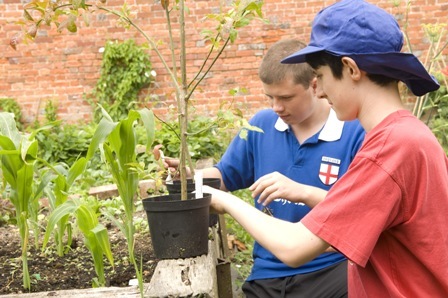 Typically, the programme is based off site and encourages our students to develop ‘employability skills’ in preparation for their transition beyond Brookfields School. The responsibilities associated with finding and securing employment are developed through role play and through real life experiences such as Work Experience and also taster days with local businesses. The students have plenty of scope to show that they can work well as part of a small group or show initiative on an individual basis. Through participation, they will learn more about themselves and their journey towards independence. Some work may be done on the school site, we have regular opportunities at places such as Rushall Farm, BCA (formerly Berkshire College of Agriculture), Newbury Rugby Club, various garden centres and St Crispin’s Orchard. Jobs change from week to week and season to season. We may be coppicing, rearing lambs, preparing a sales area or doing a mail out. Real experience in real places!